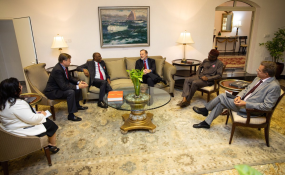 Assistant Secretary for State for African Affairs Tibor Nagy on his previous visit to Africa, meeting with Nigerian electoral officials and politicians on November 8, 2018. Assistant Secretary for the Bureau of African Affairs Tibor P. Nagy will travel to Ethiopia, Djibouti, Eritrea, Kenya, and Germany from November 27 to December 8, 2018. During his trip, Assistant Secretary Nagy will focus on promoting stronger trade and commercial ties between the United States and Africa, harnessing the potential of Africa’s youth, advancing peace and security through partnerships, and underscoring the United States’ enduring commitment to the people and nations of Africa. In all stops, Assistant Secretary Nagy will conduct bilateral meetings with government officials. In addition, in Addis Ababa, he will participate in the United States - African Union High-Level Dialogue and in Djibouti, he will meet with the Executive Secretariat of the Intergovernmental Authority on Development (IGAD). Throughout his visit, the Assistant Secretary will also engage with business leaders and alumni of the Young African Leaders Initiative (YALI). The final stop on the trip will be Stuttgart, Germany, where Assistant Secretary Nagy will have meetings with the United States Africa Command. Read the original article on State Department.